1. Pull the skin off the chicken thighs, and with a small sharp knife take out the bones. 2. Cut the chicken meat into thin strips. 3. Cut the bacon into small pieces. 4. In a large wok or frying pan, heat a little oil and fry the chicken and bacon strips until golden brown. 5. Meanwhile cook the pasta according to the instructions on the pack. 6. When all the chicken and bacon is cooked through, add the soft cheese, milk or wine and parsley to the pan, mix well and cook until all melted, season with plenty of black pepper. 7. 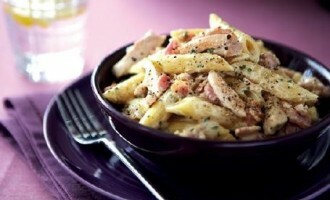 Drain the pasta and mix it with chicken, bacon and sauce, stir well and serve.